Barack Obama shouldn’t bomb Syria: The good option is to do nothing. Bombing is risky, illegal, and unlikely to help. 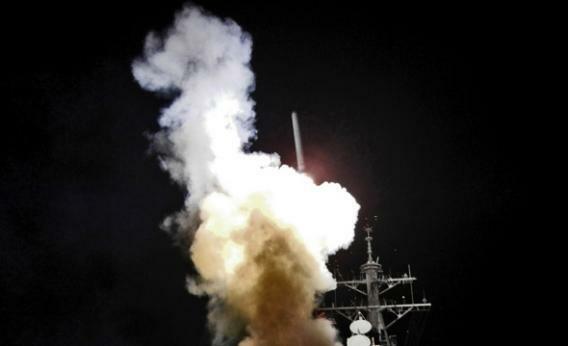 In this handout image provided by the U.S. Navy, the USS Barry launches a Tomahawk missile in support of Operation Odyssey Dawn on March 19, 2011. This is exactly what we shouldn’t do in Syria. I was in a meeting recently in Washington with a whole bunch of important people, when I heard a chilling phrase: Obama had “no good options” in Syria. It’s become a cliché. Aaron David Miller in a CNN commentary said there were “no good options” for dealing with the situation. Michael Tomasky of the Daily Beast wonders if bombing Syria is America’s “best bad option.” This is how Washington talks itself into a war that has little public support and scant basis in facts or logic. It’s completely unclear how much military strikes will weaken Bashar al-Assad’s regime and also completely unclear to what extent a weaker Syrian regime serves American or humanitarian interests. Military engagement has potentially large downsides and essentially no upsides. But we can brush that all under the table with the thought that there are no good options, which makes it OK to endorse some shoddy ones. Except, in this case, it’s total nonsense. Obama has an excellent option. It’s called “don’t bomb Syria.” Don’t fire cruise missiles at Syria either. Or in any other way conduct acts of war. Condemn Assad’s violations of international humanitarian law. If rebels violate international humanitarian law, condemn them, too. Work at the United Nations to get wrongdoing punished. Insofar as geopolitically driven Russian and Chinese intransigence prevents that from happening, accept alliance politics as a fact of life. The government of Bahrain has killed dozens of protesters since the outbreak of the Arab Spring, and America has done nothing. We haven’t cut aid to Egypt despite massacres there, and while it’s at least imaginable that we might cut aid at some point, we certainly won’t be greenlighting any cross-border attacks on the Egyptian military. We don’t have to like it when our friends in Beijing and Moscow block our schemes, but there’s no need to be self-righteous about it. In this case, the relevant rules are in Chapter VII of the United Nations Charter, which states that all countries have an “inherent right of individual or collective self-defense” in the case of an armed attack. Bombing Syria would not be an act of U.S. self-defense. Nor would it be an act of collective self-defense in which the United States comes to the aid of an ally. Beyond individual and collective self-defense, military action may be legally undertaken at the direction of the Security Council. In this case, direction will not be forthcoming, which is what makes Obama’s choice easy. He needs to stick with the pursuit of a rules-based international system by, in this case, playing by the rules. This is a good option. What makes it a bad option in the eyes of many is the reality that following my advice will lead to the deaths of many Syrian civilians. That is truly and genuinely tragic. On the other hand, it is by no means clear that bombing military institutions will reduce the number of civilian casualties. Historically, military intervention on the side of rebel groups has increased the pace of civilian deaths, not decreased it. More to the point, if you put arbitrary framing issues aside, the United States stands by and does nothing in the face of human tragedy all the time. Millions of desperate people in Haiti, Mexico, Nicaragua, and elsewhere would love to escape dire poverty by moving to the United States to work, and we don’t let them. Nobody in Washington is doing anything about the ongoing civil war in Congo. One way to look at this—the heartless way—is that the United States is really good at being indifferent to foreign suffering, and that in the case of Syria, we have a pretty strong reason for indifference. Another way of looking at it—the bleeding-heart, correct way—is that Americans ought to care more about the lives of people outside our borders. That we ought to be more open to foreign immigration and foreign trade to help bolster foreign economies. That when the Office of Management and Budget does cost-benefit analysis for regulatory measures to curb greenhouse gas emissions, it ought to consider the impact on foreigners. That both as individuals and as a government we ought to do more to support charities such as the Against Malaria Foundation or Give Directly that save 10 times as many innocent lives or more than humanitarian military interventions. To be clear, the mere fact that bombing is rarely an optimal or cost-effective way of helping foreigners is not a reason to avoid doing it. The reason to avoid unilateral bombing campaigns is that the pursuit of long-term peace requires the United States to play by the rules. But if reading the news or watching television and thinking about the poor Syrian civilians is leaving you so conscience-stricken that somehow allowing the civil war to continue is intolerable, then think about all the other suffering you aren’t seeing on TV. Try doing something to help some of those people. President Obama himself needs to consider that his and his senior staff’s time and attention are one of the scarcest and most valuable resources on the planet. He needs to be spending that time wisely. If he finds himself pondering a problem for which he thinks he has “no good options,” that means he ought to move on to something else—to problems for which he does have good options but where the issue itself is languishing in obscurity. But for an unsolvable problem like Syria, the good option is the sensible one: Do nothing, and don’t start any unnecessary and illegal wars.